AUCTION PRICE: %PRICE1% %CURR1% CURRENT PRICE: %A_CURRPRICE% %CURR1%. 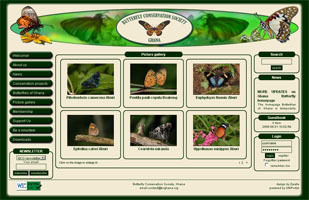 The official webpage of the Butterfly Conservation Society, Ghana. The idea of BCGHANA has emerged in young enthusiastic lepidopterists who are engaged with nature conservation, and have recognized the terrible amount of habitat loss of butterflies caused mainly by deforestation, mining activities, non-sustainable agriculture and bush fires in Ghana.